Are you looking for a studious fellow with a handsome face and a taste for mushroom soup? Well look no further! 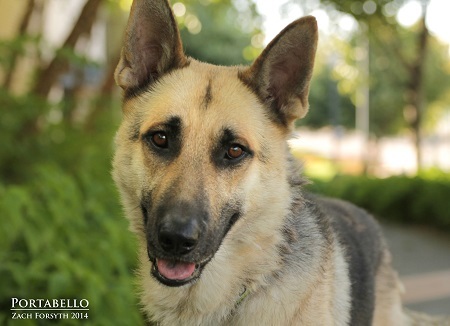 My name is Portobello and I’m a high-energy 1 1/2 year old German Shepherd looking for some adult friends to have high-brow and serious conversations with. I tolerate children quite well, but to be frank I’m looking for more maturity in my life. I need a dedicated companion who wants to go to classes with me and help me soak up all there is to learn! Maybe after agility we can learn chess? Ok, I know, I need to get out a little more and make friends of my own species, maybe you can help with that too? I’m OK with other dogs (best without kitties), but could really use some help with my socialization. I’m the middle school nerdy boy at the dance, I’m awkward now but you know with my smarts and your guidance I’m going to be the coolest adult (and start up a tech company or something). Will you help me be my most amazing self? I am fixed, vaccinated and microchipped. I have been transferred to Columbia County Humane Society, for more information please give them a call at (503) 397-4353.